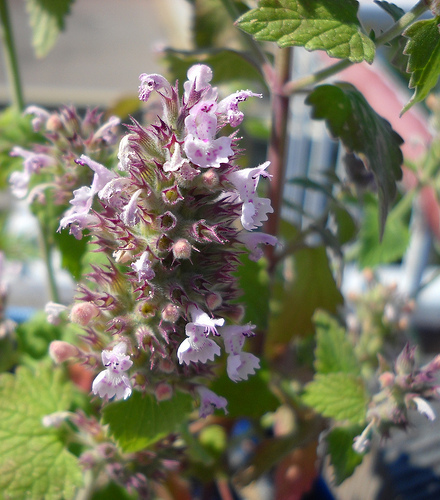 Catnip (nepeta cataria), a member of the mint family, contains nepetalactone, a substance that causes euphoria in the majority of cats over three months of age. Most very young kittens don’t respond to it, though I’ve seen a few exceptions over the years. Cats can’t become addicted to catnip, but they may stop responding to it with frequent exposure. Catnip has no adverse health consequences for cats. It makes them happy, and has the added benefit of diverting them from snacking on houseplants. Cats need to snack on greenery from time to time, and while keeping cats indoors is safer due to the dangers facing outdoor cats, the indoor lifestyle deprives them of natural fresh-growing grass. Catnip is easy to grow, and owners may wish to create a little cat garden in a low pot or tray, with catnip and cat grass (barley, rye, or oats) to provide indoor cats with some greens. Many cats just sniff or roll in catnip, but some like to eat it. Eating a lot of catnip may make a cat throw up, which can happen when cats eat any harmless plant, including grass (see pet-safe plants and toxic plants for lists of harmless and harmful plants). If your cat has a tendency to gobble fresh or dried catnip and then vomit, switch to catnip toys. Catnip is a potent pest repellent. Grown in a garden, it can be used as a form of natural pest control, providing some protection against aphids, corn earworms, cucumber beetles, flea beetles, Japanese beetles, squash bugs, and mice. For more information on catnip, see Why Cats Like Catnip and Catnip and Catnip Toys. Reference: Hodgkins, Elizabeth M., DVM. (2007). Your Cat: Simple New Secrets to a Longer, Stronger Life. Thomas Dunne Books.